After the Honda started acting up again a few weeks ago, Scott took it to the shop and the news wasn’t good, it needed $1,500 in transmission work. We were still trying to decide what to do about the Honda when we took the Jeep to be inspected. We were down to one car for a week…that was not fun. After ~$700 in repairs to the Jeep to pass inspection we had it back in time for Scott to drive back and forth to the Air Force base that weekend. Sunday afternoon while he was driving home, the engine died, in dramatic fashion, inside the Fort Pitt Tunnel. When he called me from the tunnel I was so grateful that he was ok and that there were no other cars involved. We needed to make some quick decisions, life with one car is not a good situation. 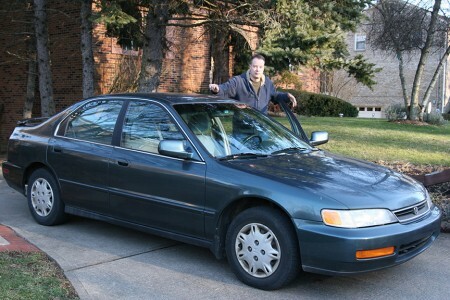 Monday morning we decided it was time to retire the 2002 Jeep and the 1997 Honda. 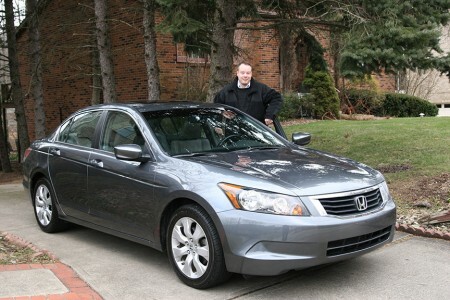 Scott searched the Honda website for cars in the area and by the end of the day he was home with a 2008 Honda Accord. So now we have 2 reliable vehicles. I can’t tell you much about the new car. I was supposed to drive it today, but Scott decided it would be easier to move both of the boys’ car seats and have me take the van instead. So now the boys have been in the car and Juliana went for a ride earlier this week. Someday I will go for a ride in the new Honda and maybe even drive it.